If you’re a procrastinator, outlaw, or the best long-distance boyfriend ever, you should download Flight Tonight to book your next vacation, incognito location, or surprise visit to buy and fly that day. 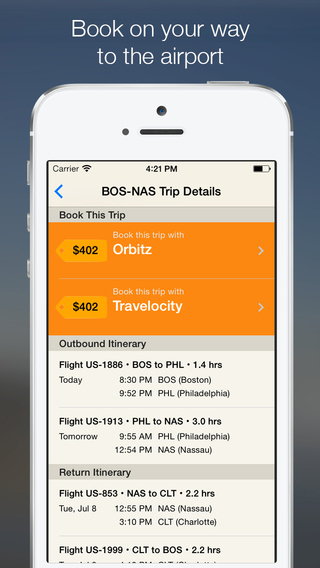 Developed by Boston-based travel tech start-up, Hopper, the on-demand app hopes to capitalize on the ‘Uberization’ of travel, getting people to their destinations faster and with real-time booking. Last year Expedia released a study online with 2,000+ U.S. adults asking about last-minute trips and mobile functionality concluding that 92 percent consider themselves a little spontaneous. Of the respondents, 30 percent said they have taken last-minute trips out of town and 28 percent indicated they dream of taking a spontaneous trip to an exotic location. Hopper recognizes the ideal time to book a flight for the best price is 50 to 20 days before the flight, but some routes (the company uses San Francisco to Richmond, Virginia, as an example) take a nose dive in prices on the day of travel. Given the rarity of this situation, Flight Tonight has developed a monitoring system for airfares exclusively for round-trips departing the same day users search. When you open the app, a James Bond-esque character encourages spontaneity, and entering your home airport lets you view any last-minute flight deals anywhere in the world. 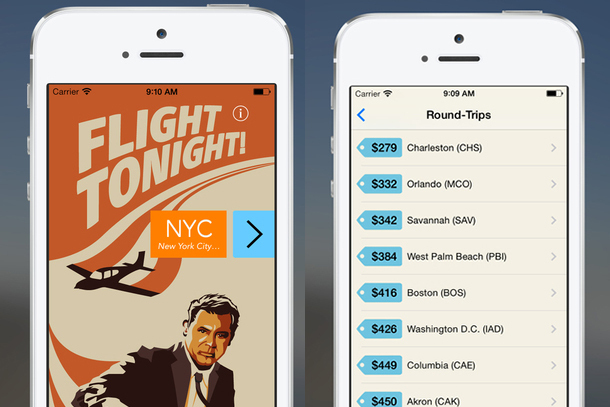 The app searches for flights departing in a 2 to 24 hour window and sorts by price. Users can then book through a variety of online booking sites (Orbitz, Travelocity, Expedia), a feature which sets Flight Tonight apart from competitor app Next Flight. Next Flight, searches over 1,000 carriers and lets you see a day’s worth of flights in the event your first flight was canceled or delayed. Unlike Flight Tonight, the app is not free and is designed more for previously planned travel that has run into unexpected delays. Flight Tonight’s concept is based on more of a travel trend than functionality in comparison. With today’s release date, it will be interesting to see how the app will be used. To see it in action, you can follow the company’s editor, Dakota, on his own Flight Tonight experience via Facebook. So, are you part of the 92 percent that considers itself spontaneous? Would you consider booking a last-minute getaway?